An exhibition entitled, "The Unground", which opened in St. Petersburg on June 3 in the State Museum of the History of Religion, tells the story of the spiritual resistance of Christians against the militant atheist regime. Documents, personal belongings, photographs, and videos from archives in the Ural Mountain region and personal collections are a testimony to the uncompromising resistance that the Church portrayed against the evil that was unleashed against it with particular strength. Here can be seen the handmade vestments of catacomb priests and exiles, prison bowls used for Communion in place of potirs, and registers of the executions of clergymen. Items from the camps, artworks by the exiles, and letters written by confessors of the faith tell of life in the Church in the Ural Mountain region from the time that the soviet regime came to power, until the 1970's, reports Living Waters (Zhivaya Voda). "The 20th century saw persecutions against the Church in Russia on an unprecedented scale. Nevertheless, the past century has not only bequeathed to us the memory of evil's destructive power, but also a testimony to hope in God's mercy, which conquers evil, and manifests itself in the lives of Christians. 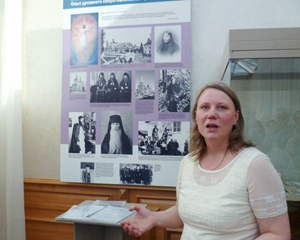 Despite the terrible circumstances, people were able to live, be joyful, and retain a refined understanding of the world, of God, man, and the Church," noted the author of the exhibit, Oksana Ivanova. In her words, the exhibit gives us an opportunity to see, through the example of the Ural region, a picture typical of the entire country as the Church was being destroyed, and the faithful repressed. It is a reminder of the fate of a people over whose lives rolled the "red wheel." By getting to know the experience of those who remained "unground" in the meat grinder of history, who spiritually withstood and were victorious by the strength of their faith, we who live in the 21st century can find help in our search for ways to overcome the crisis caused by the disruption of our traditions. Those clergymen present at the opening unanimously noted that as the years go by, the theme of veneration of the New Martyrs and Confessor of Russia has lost its acuteness. "Sometimes the woeful impression forms that we glorified the New Martyrs in order to consign them to oblivion. Could they really have died so that we who remain would create such a life in the Church as we have? This question could become the creative stimulus for the development of our spiritual life," noted Archpriest Giorgi Mitrofanov, a member of the Synodal commission for canonization. "What turned Russia not only into a host of new martyrs, but also a band of new torturers?" is the question Fr. Alexander Sorokin offered for thought. The exhibits on display were first collected by the museum personnel of Ekaterinburg. Having become a travelling exhibition, it gains more items as it visits different Russian cities. In this way, the memory of the New Martyrs is being renewed. The exhibition is open until July 3 at Pochtamtskaya Street, 14, from 11:00 to 18:00, and closed on Wednesdays.